This book blew me away! 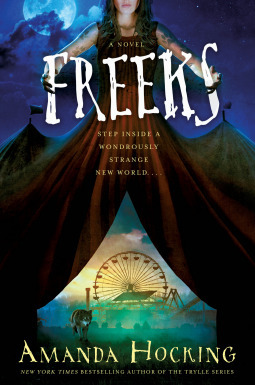 I don't read many books about carnivals but after this, I definitely think I should start. I liked that it was set in the 80's because I don't read many books set in that time period. After Stranger Things, I think everyone is a little obsessed with the eighties right now so this will appeal to people for more than one reason. I really liked Mara and Gabe both as a couple and separately. I wished Mara wasn't embarrassed about the fact that she was a carnie but I get it. I wouldn't want to tell people either. I liked when Gabe stuck up for her with Selena's boyfriend that guy was a jerk. Why was she even with him? I did wish someone would have punched him though because he definitely had it coming. The carnival side of the book was cool. I liked that they were all more like a family than co-workers or roommates. They took care of each other and that was nice to see because some families aren't as close as these people were. The magical side of the book was awesome but I'm not sure whose ability I would want. Probably Blossom, the little we got to see of her. All in all, this was an awesome book and I think a lot of people will enjoy it.